Despite appearances (and a lack of overtaking, and stuff) F1 cannot be said to be predictable. And it wasn't in Sochi. In advance we thought it Merc's - and by extenion Lewis Hamilton's - to lose. Then for much of the weekend itself it looked like Ferrari would run and hide. 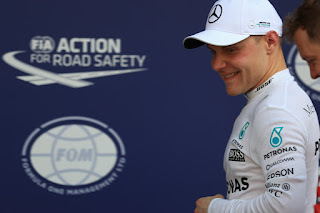 Come the race though it was none other than Valtteri Bottas who faced all down to win for the first time ever in his F1 career. Like The Alchemist, everything in Bottas's universe aligned in his favour. Like the alchemist, Bottas turned silver into, this time, gold.